Kopp, B.J., Fleckenstein, J.H., Roulet, N.T., E. Humphreys (Elyn), Talbot, J. and Blodau, C.
Long-term impacts of drier conditions on the hydrology of northern peatlands are poorly understood. We used long-term drainage near a historic drainage ditch, separating an area from the main peatland, as an analogue for long-term drying in a northern temperate bog. The objective was to identify the impact of drier conditions on ecohydrological processes and groundwater flow patterns in an area now forested and an area that maintained a bog-like character. 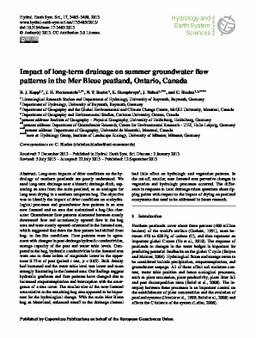 Groundwater flow patterns alternated between mostly downward flow and occasionally upward flow in the bog area and were mostly upward-orientated in the forested area, which suggested that there the flow pattern had shifted from bog- to fen-like conditions. Flow patterns were in agreement with changes in post-drainage hydraulic conductivities, storage capacity of the peat and water table levels. Compared to the bog, hydraulic conductivities in the forested area were one to three orders of magnitude lower in the uppermost 0.75m of peat (paired t test, p <0.05). Bulk density had increased and the water table level was lower and more strongly fluctuating in the forested area. Our findings suggest hydraulic gradients and flow patterns have changed due to increased evapotranspiration and interception with the emergence of a tree cover. The smaller size of the now-forested area relative to the remaining bog area appeared to be important for the hydrological change. With the main Mer Bleue bog as hinterland, enhanced runoff to the drainage channel had little effect on hydrologic and vegetation patterns. In the cut-off, smaller, now forested area pervasive changes in vegetation and hydrologic processes occurred. The difference in response to local drainage raises questions about tipping points with respect to the impact of drying on peatland ecosystems that need to be addressed in future research.